My background in coaching started in 1997 when I started coaching youth soccer. Since that time I coached all age groups, including adults. I also coached at the high school level and played on two soccer teams for several years. I have always been very active in many sports my entire life. In May of 2010 I became very ill and spent 6 months where I was not allowed to do any exercise. It took two years and 5 surgeries to completely recover. In August of 2012, needless to say, my body was a shell of what it used to be. I went to a friend of mines house who coached CrossFit in his garage and began my fitness journey. I also had a friend I met through CrossFit who helped changed my diet and taught me the proper way to eat. In the next 3 years I lost 28 lbs and lowered by body fat to below 13%. I was hooked on CrossFit!!! In August of 2015 I moved to Tucson and started going to Purgatory. In September 2015, I decided I wanted to continue coaching but that it would be CrossFit instead of soccer. 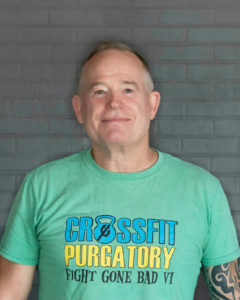 I got my Level 1 in September 2015 and have been coaching at Purgatory since then. There were a lot of Crossfit coaches that helped me along my fitness journey. My goal is to help anyone and everyone to achieve their fitness goals as all the great coaches have helped me.